Mental retardation is a delay, or slowness, in a child's mental development. The child learns things more slowly than other children his age. He may be late at beginning to move, smile, show interest in things, use his hands, sit, walk, speak, and understand. Or he may develop some of these skills more quickly, but be slower in others. Mental retardation ranges from mild to severe. The child who is mildly retarded takes longer to learn certain skills. But with help he can grow up to care for himself and take an active, responsible part in the community. The child who is severely retarded, as he grows older, may stay at the mental age of a baby or young child. He will always need to be cared for in some ways. Mental retardation cannot be cured. However, all mentally retarded children can be helped to progress more quickly. The earlier special help or 'stimulation' begins, the more ability the child is likely to gain. IMPORTANT: In this chapter we look at some of the causes of mental retardation and briefly describe 2 common forms (Down syndrome and cretinism). However, mental retardation is only one of the reasons for slow development in children. A child who is blind will be slow in learning to reach and move about unless he has extra help and encouragement. A child who is deaf will be delayed in learning to communicate unless he is helped to learn to 'talk' in other ways than speech. A child who has a severe physical disability is often slow in developing use of both his body and mind. Because 'developmental delay' is common with so many disabilities, we include discussion of it in several separate chapters. Information on helping a child who is mentally retarded or developmentally delayed is in Chapters 34 to 40. Chapters 34 and 35 discuss early child development and ways to help or 'stimulate' a child to learn early skills (use of the senses, movement, and communication). Chapters 36 to 39 discuss learning for self-care (feeding, dressing, toileting, and bathing). Chapter 40 discusses child behavior, and ways to encourage behavior that helps learning. Other ideas for helping retarded children are in the CHILD-to-child activity on pages 442 to 445. The needs and problems of mentally retarded children as they become sexually grown up are discussed in Chapter 52, Page 495. One important need that we do not include in detail in this book is education for retarded children. Some possibilities are discussed in Chapter 53, on education. But often special teaching methods and materials are needed. An excellent book is Special Education for Mentally Handicapped Pupils. (See Page 640.) For toys that help a child learn, see Chapter 49. Often the cause is not known. Some children are born with a very small brain, or the brain does not grow or work normally. Sometimes there is a 'mistake' in the 'chromosomes' or the tiny chemical messages that determine what a child will be like (inheritance). This is what happens in Down syndrome. • German measles during early pregnancy. A child with microcephaly (small brain) is mentally slow and often also develops certain physical problems. For measurements of head size, see Page 41. In many parts of the world, the most common causes of mental retardation are brain damage and Down syndrome. But in some mountainous areas, it is very often caused by lack of iodine in food and water (see Page 282). Usually there is no treatment for mental retardation. Therefore, we often do not need to know the exact cause. Instead, we need to help the child develop the best he can. However, in some cases, certain medicines, changes in diet, or prevention of further poisoning can make a big difference. If a child has any signs of cretinism or seems to be gradually losing mental ability, try to get expert medical advice. Prevention of mental retardation is discussed with its different causes. See especially cerebral palsy (Page 107), Down syndrome (Page 281), and cretinism (Page 282). Some people confuse 'mental retardation' with 'mental illness'. But they are very different. A person who is mentally ill may have normal or high intelligence, and may be highly educated. But because of stressful experiences, or some illness affecting the brain, his behavior becomes strange. When a retarded person behaves in an abnormal way, it is usually because he has not learned the correct way to behave; he needs to be taught. The mentally ill person needs special help-perhaps from a spiritual healer or 'psychiatrist' (soul doctor). Persons with mental illness are like persons with any other illness. Often they cannot control their strange behavior. We should not blame or punish them, but give them love, protection, and understanding. 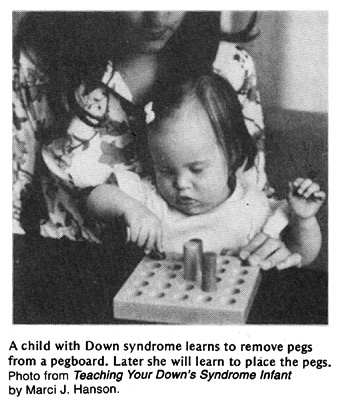 In many areas, Down syndrome-or 'mongolism'-is the most common form of mental slowness, or retardation. These children are slower than others in learning to use their bodies and their minds. There are also certain physical signs or problems. (This combination of various signs is called a 'syndrome'.) The baby does not develop normally in the womb because of an error in the 'chromosomes' (material in each cell of the body that determines what a baby will be and look like). At birth, baby seems floppy and weak. Baby does not cry much. The baby is slower than other babies her age to: turn over, grasp things, sit up, talk, walk. When suddenly lowered, the baby does not react by spreading her arms, as a normal baby does. A fold of skin covers the inner corner of the eyelid. Eyelids may be swollen and red. The iris of the eye has many little white specks; like sand. These usually go away by 12 months of age. short wide hands with short fingers. The little finger may be curved, or have only one fold. Elbow, hip, and ankle joints may be very loose and flexible. One out of 3 has heart problems. May develop leukemia (blood cancer). Check older children for hearing and seeing problems. One out of 10 has deformed neck bones which can slip and pinch the nerve cord in the spine. This may cause sudden or slowly increasing paralysis -or sudden death. Mental retardation in children with Down syndrome can be mild, moderate, or severe. Some children never learn to speak. Others talk (and often love to talk). Many can learn to read and write. Most of these boys and girls are very friendly and affectionate, and behave well with people who treat them well. Even those who are more severely retarded, with help and good teaching usually learn to take care of their basic needs, and to help out with simple work. They can live fairly normally with their families and communities. In rural areas particularly, they can learn to do many important jobs. Sometimes they do repetitive jobs as well or better than other people. But their physical and mental development is slower than normal. So parents and all those who take care of these children must be very patient with them and from a very early age do all they can to help them develop their mental and physical capabilities. To avoid or solve behavior problems, parents need to be very consistent in how they treat their children and in what they expect of them. The child needs a lot of praise and encouragement for things he does well (see Chapter 40). Some children with Down syndrome can go to school, but they will need extra help. 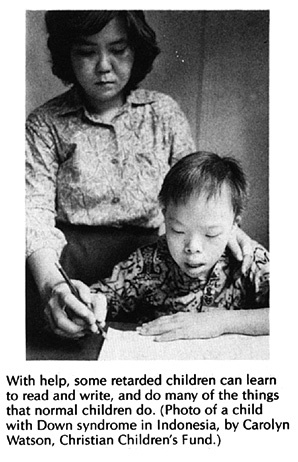 It is important that teachers understand their problem and help other children to treat the retarded child with respect. Unless the child is given understanding and extra help at school, in rural areas it may sometimes be better for the child with Down syndrome to be educated at home through helping his family around the house and in the fields. Help the child to develop her or his mental and physical abilities. Protect the child from infectious diseases. Here we will discuss the last 2 concerns. The first we will cover in other chapters. IMPORTANT: For a child who has Down syndrome, or is mentally slow, be sure to read all the chapters on early child development and learning basic skills, Chapters 33 to 41. Children with Down syndrome get sick more often than other children. They can easily catch colds, bronchitis, pneumonia, and other infections. So it is very important to protect their health. Vaccinations can protect her from many childhood diseases. A child with Down syndrome who catches measles or whooping cough can easily get pneumonia. Early medical attention When she gets a sore throat, earache, or bad cough, take her to a health worker as soon as possible. Check all newborns for possible dislocated hip, so that it can be corrected as soon as possible (see Page 155). do not use hard shoes that bend the big toe inward like this. It is better to wear tennis shoes, or other soft shoes, or sandals. When the big toe sticks out a lot, its position can sometimes be corrected with surgery, so that shoes will fit without problems. If any sign of paralysis or lack of feeling develops in the hands, feet, or body, get advice from an orthopedist or a neurosurgeon. One out of every 800 children is born with Down and it occurs more commonly with mothers under 20 and over 35 years of age. Women over 40 (or even over 35) may want to consider not having more children. Also, if a couple already has one Down child, the chance of having another is higher than normal (about one in 50). In some countries a test (amniocentesis) can be done at about 4 months of pregnancy to see if the child will have Down syndrome. If so, the family can consider abortion (in societies where this is permitted). Cretinism is a delay in both mental and physical growth that comes when a child's body does not produce enough 'thyroid'. Thyroid is a substance, or 'hormone', that controls a child's growth and body functions. Without it, everything goes slower. Thyroid is produced by a gland in the front of the neck. To produce thyroid, the gland needs iodine. Most people get enough iodine from water and food. But in some areas, especially in the mountains, the soil, water, and food have very little iodine. In an attempt to obtain more iodine, the thyroid gland sometimes grows very large, forming a swelling called a goiter. In areas where there is little iodine and a lot of people have goiters, cretinism is common. In these same areas, often many children have difficulty hearing or are somewhat retarded mentally. Although they do not show all the typical signs of cretinism, the cause is probably the same. Occasionally, in areas where goiter is not common, cretinism occurs for other reasons than lack of iodine. SIGNS Below we show some of the typical signs of cretinism and compare them with Down syndrome, which cretinism resembles in some ways. It is often difficult to tell if a newborn baby has cretinism. She is often born large and then fails to grow normally. The baby may have feeding difficulties, or breathing difficulties or make noises because of the large tongue. She moves and cries little. By 3 to 6 months the mother often becomes worried because the baby looks dull, takes so little interest in things, sleeps so much, and is slow in all areas of development. As child grows, knees may get large and painful. For other signs, see Page 279. WHAT TO DO Early and continued treatment with thyroid medicine helps improve growth, physical appearance, and sometimes can reduce or prevent mental retardation. For best results, treatment should begin during the first month of life. For this reason, as soon as you suspect that a baby might have cretinism, get skilled medical advice. To help the child develop mentally and physically, and learn basic skills, read Chapters 34 to 41 and use the ideas that can help meet the child's needs. With early treatment and guided learning, many children with cretinism can learn to care for themselves and do simple but important work in the community. For ideas on managing constipation, see Page 212. PREVENTION In areas where goiter is common, cretinism (and deafness) can be greatly reduced by encouraging everyone to use iodized salt.